Choosing the right metal for a diamond ring (or any piece of jewelry) is just as important as choosing the diamond itself. The colors, strengths and qualities of different metals can vary greatly, so you want to be sure you pick one that suits the person who will be wearing it, and their lifestyle. When you first look at choosing the metal type for a diamond ring ‘gold’ is the first word that comes to mind. But do you want yellow gold, or white gold? What about platinum, even titanium? Finding the right metal is about more than just color and shine. If you plan on giving an engagement ring to someone who works with their hands, you might want to choose a tougher metal that will withstand dents and scratches. There are dozens of metals and elements by jewelers in creating rings nowadays, and it’s important that you choose the right fit for the finger it will go on. Yellow gold is by far the most traditional metal used in engagement rings, wedding rings, and most traditional jewelry. It has been one of the world’s most valuable trading commodities since before the human race even got around to writing history books. Yellow gold is renowned for its beauty as well as its value. It’s luxurious, wealthy golden shine is an instantly recognizable hue that draws the eye towards it. This mixture of elegance and eye catching is just one of the reasons why it is so popular in engagement rings. Whilst white gold has grown in popularity in recent years, yellow gold is still often the favorite for engagement rings since it contrast clearly with a diamond, highlighting the stone even more clearly! When it comes to choosing a gold metal for your jewelry or ring, you can judge the quality by looking at the Karat value. The Karat value will normally be stamped in to the gold, so you can quickly see if the gold is pure, or mixed heavily with other elements. 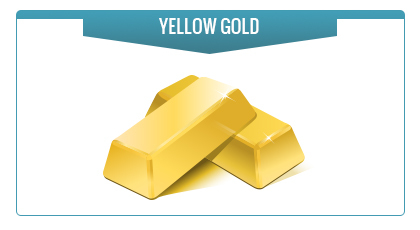 A higher Karat rating relates to a higher purity of gold. For instance, a 24 Karat diamond is 99.9% pure, the more common 18 Karat gold used in jewelry is 75% pure. The value drops until you reach 10 Karat gold, which is just over 41% pure, and generally the lowest quality of gold you will find in cheap jewelry. The majority of gold is closer to 14 or 18k than 24k. 14-18k gold helps keep the price affordable, whilst still maintaining the real ‘gold’ color, but also keeps the metal durable. Generally, “pure,” or 24 karat gold is too soft to be used in jewelry. Sometimes different elements are added to give an enhanced color. For instance ‘Rose Gold’ contains larger than normal quantities of copper to give a reddish hue. White gold has seen a huge growth in popularity over the last few years, especially when it comes to engagement rings and wedding bands. Silvery in color, but without the constant tarnish, white gold is perfect for those who want a subtler ring that will last a lifetime. Whilst yellow gold can contrast with a diamond, white gold enhances the Diamond, making it look more clear and bright. 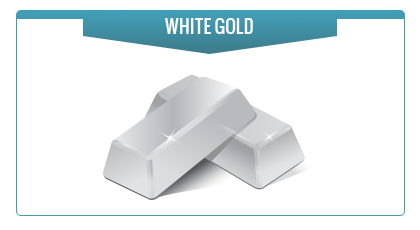 White gold is created by creating an alloy with gold and then nickel, manganese or palladium, sometimes a mixture of the three. Just like yellow gold, white gold is judged on a ‘quality scale’ similar to yellow gold. Different alloys do come with different qualities, some are slightly softer, which is ideal for those who want a band with embedded stones, others are harder, and will be more resistant to scratch marks. No matter what the elements used are, one thing is for sure. You will have a piece of jewelry that will look great and last for years to come. 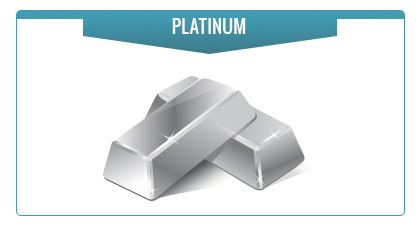 Platinum is the world’s rarest element, and one of the more expensive. In color it is similar to white gold, although it is more malleable and lustrous than Gold. It is also tougher, and more scratch resistant than gold, reducing issues with scuff marks and scratches that are a common issue with gold rings. Platinum is one of the ultimate symbols of wealth, which makes it a great gift, and a huge token of love. Many of the most exquisite pieces of jewelry use platinum as a base, because of its qualities and its value. These same qualities also make platinum a popular choice for both wedding and engagement rings. One of the true virtues of platinum is its malleable and ductile nature, this allows it to be shaped in much more intricate shapes and patterns than gold. Platinum is graded on a slightly different scale to Gold, and is usually stamped with a mark between Pt850 and Pt1000. The grade is actually a percentage, so a Pt999 is 99.9% pure.